So long as a strong man fully armed guards his own home, his goods are undisturbed; but when someone stronger than himself attacks and defeats him, the stronger man takes away all the weapons he relied on and shares out his spoil. /Luke 11, 21-22/. These words of the Gospel of Luke describe perfectly the terms imposed on the defeated Germany by the victorious Entente Powers. Clause four of the Armistice Terms signed on November 11, 1918 ordered the immediate demobilization of the air force and handing over 2000 (1700) aircraft, particularly the Fokker D.VII fighters. The Fokker D.VII was the only aircraft mentioned by its name. Why was that? Why was this type of plane so important to those dictating the terms of the armistice? The answer is both simple and obvious. 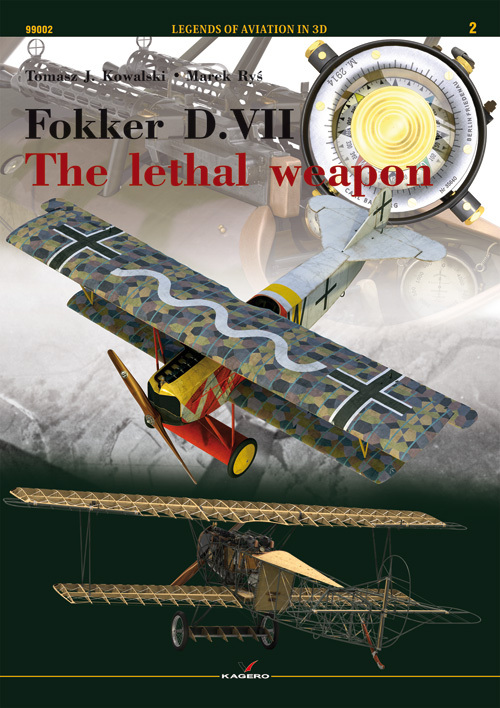 Performance of the Fokker D.VII was superior to any aircraft used by the victorious powers. It was an aircraft that would highly influence designs of numerous inter-war fighter planes. It was good enough to remain in service with various national air forces until the mid-thirties. Anthony H. G. Fokker was a Dutchman born in Blitar on Java Island. In 1910 he came to Germany, where in Mainz he finished an aviation course. Being a talented businessman, he founded a workshop in Johannisthal, where he built his first aircraft named Spinne. The plane was purchased by many, including the military, which enabled Fokker to expand his modest workshop and open a flight school. In 1913 Fokker relocated his factory to Schwerin-Görries with Martin Kreutzer as his chief designer (It was a bit of an overstatement to call it a factory, since at that time there were only, or as many as 25 workers). In 1914 the Fokker factory built a mixed construction monoplane based on the Morane Saulnier N design. Its fuselage and tail unit frames were welded of steel tubing, while the wings were of wooden construction. The entire airframe was fabric-covered. Mixed construction became a trademark of all 1913 to 1918 Fokker designs. A monograph of Fokker’s designs deserves a separate, in-depth publication. The Fokker E.I to E.IV aircraft, built strictly for fighting enemy planes, are worthy of mention. The Fokker E.I was the first fighter aircraft armed with synchronized machine gun that could fire through the arc of a spinning propeller. Gun synchronizer (a device that prevented a machine gun from firing when the propeller blade was in front of the barrel) was designed in the Fokker factory by Heinrich Luebbe’s team. The Fokker E.I to E.II aircraft, although not very modern in 1915 and early 1916, gave the Germans a temporary air supremacy over Allied planes which apart from deflectors had no synchronization gear. At the end of 1915 the Fokker factory faced difficulties. The Inspectorate of Aviation Troops (Idflieg) blamed the company for poor performance of the Fokker D.I to D.IV fighter biplanes and equally poor workmanship presented by those planes. The real story of the Fokker D.VII development began with Martin Kreutzer’s death. His post of chief designer was taken by Reinhold Platz, a brilliant, self-taught man of remarkable technical intuition. With Anthony Fokker’s good understanding of plane’s in-flight performance and hunt for technological innovations they both created a team of great creative potential. Anthony Fokker suggested using a thick profile of the wing, similar to that used by Junkers with thickness ratio up to 20%. This, along with the use of stressed plywood skin observed in designs of the Swedish engineer Villehad Forssman, who worked in Germany, would strengthen the wings structure and improve their aerodynamics. An entire series of experimental planes – Versuchflugzeug V.I to V.IV was built. The experimental V.II (or V.2) became a starting point for the design of fighter biplane, while the V.IV (V.4) became a prototype for the Dr.I triplanes. The Fokker Dr.I, despite its many shortcomings and relatively poor quality of workmanship, became a favourite aircraft of many aces including the “Red Baron” Manfred von Richthofen. Only 320 triplanes were built. In the spring of 1918 at the front lines they were becoming a relic of the past and were no match for Allied fighters such as inline engine powered Spad S 13C1, Se 5a or rotary engine powered Sopwith Camel. Idflieg held a two-stage D-Jagdflugzeug-Wettbewerb – a competition for a fighter plane design to choose the best one out of the offers presented by the Albatros, LVG Roland, Rumpler, Pfalz, Siemens-Schuckert and Schutte-Lanz. The first stage took part on January 21 to 28, 1918 and consisted of testing the submitted planes by frontline pilots including Manfred von Richthofen, Adolf Ritter von Tutschek, Bruno Loerzer, Hans Georg von Osten, Erich Löwenhardt and Theodor Osterkamp. Their task was to point out the best plane after test flying each of them. The second stage was concluded in mid February and consisted of the rate of climb and horizontal velocity trials performed by factory test pilots. To make the tests comparable all planes were equipped with the same type of propeller and flew on the same fuel. Test were conducted in two categories – inline engine powered and rotary engine powered planes. The letter was referring to the V.11 (Wn 1883) biplane prepared for the first fighter plane competition at Adlershof. Components of the Fokker Dr.I, like fuselage and tail unit welded of steel tubing, were utilized in its construction. The forward section of the fuselage was modified to accommodate an inline liquid-cooled 160hp Mercedes D.III engine with a rectangular, car-type radiator, the same as in the D.VII. Wing cellule was a completely new design. Both upper and lower, thick profile, two-spar wings were of wooden construction, covered with fabric. The upper wing, moved noticeably forward (there was no need for a cut-out in the trailing edge to provide better cockpit visibility), was attached to the fuselage by a tripod strut pylon made of steel tubes and a single strut. Upper and lower wing were joined by a pair of N-struts. There were two more prototypes prepared for the competition designated V.9 and V.13. They were of analogous construction, but equipped with 120 and 145hp Oberursel rotary engines respectively. On December 12, 1917 construction of a second plane designated V.18 (Wn 2116) with longer fuselage and larger vertical stabilizer was commenced. Thus, the centre of gravity was shifted backwards and therefore it was necessary to move the upper wing back, which required a cut-out being made in its trailing edge. The plane was powered by the Mercedes D.III engine. Also, the undercarriage wheel track was increased. Fokker V.11 (Wn 1883) won the first fighter plane competition in the inline engine powered planes category. The Rumpler 7D4 came second. It had a higher horizontal velocity and rate of climb than the Fokker’s design, but according to pilots its handling qualities were worse. There is a story connected with the winning aircraft told by Anthony Fokker himself. On the weekend of January 26-27 Manfred von Richthofen flew the Fokker V.11 and after landing he pointed out its essential shortcomings: directional instability in a dive, not the best manoeuvrability and poor upward visibility. Fokker was supposed to bring welders, who lengthened the fuselage by 40cm, relocated the upper wing in which they made a cut-out to improve cockpit visibility. That was how the Fokker V.11/II was created. These modifications substantially improved the plane’s flying qualities. Nowadays, it is hard to explicitly determine if the story is true or if it is yet another legend created by Anthony Fokker around himself and his designs. The second Fokker V.18 was withdrawn from the competition after an accident that happened during taxing. One of the Oberursel works mechanics, taxing a rotary engine powered Fokker collided with the stationary inline engine powered Fokker V.13 and the Albatros DV. Both damaged aircrafts were put out of the competition. In the rotary engine powered planes category the leading place was taken by the Fokker V.13. The lack of 115 kW (160 hp) Siemens-Halske engines (they had not been manufactured) forced the use of 90 kW (120 hp) Oberursel engine in the second stage of the competition, which naturally decreased the plane’s performance. It was accepted for mass production as the Fokker D.VI. Sixty planes were built and sent to the combat and home defence units (Jasta 80 and 84), as well as flight schools. Idflieg ordered 300 Fokker V.11 planes. Serial production aircraft received designation Fokker D.VII. The V.11 and V.18 prototypes were rebuilt to meet production standards and received serial numbers 227/18 and 228/18 respectively. The Fokker D.VII underwent its Typenprüfung (type-testing programme) in February 1918. It included a number of static and endurance tests on completion of which the Idflieg officially authorized the plane’s series production. The initial order placed with the Fokker factory called for 300 planes. It was followed by further ones, but since the Fokker factory did not possess sufficient production capacity, the construction of Fokker D.VII planes was commissioned to the Albatros Flugzeugwerke in Johannisthal and its subsidiary the Ostdeutsche Albatros Werke (OAW) in Schneidemühl (now Piła). These were 400 planes (serial numbers 527/18 to 926/18) and 200 planes (serial numbers 2000/18 to 2199/18). Owing to Anthony Fokker’s mercantile skills, his company received 25 000 marks for each manufactured plane, while the subcontractor – the Albatros factory, only 19 000. Fokker also received 5% royalty of the value of each manufactured machine. Fokker loaned the Albatros factory one complete 230/18 aircraft and it was used as a base for preparing the construction drawings and technology of building welded steel tube fuselage frames. It must be stressed here, that individual components manufactured by different factories were not interchangeable. The planes differed not only in the internal details, but also in external ones – mainly the location and shape of cooling louvres in the engine cowling, as well as the typeface and location of type and serial number markings. The first 21 Fokkers were commissioned at the turn of February and March. 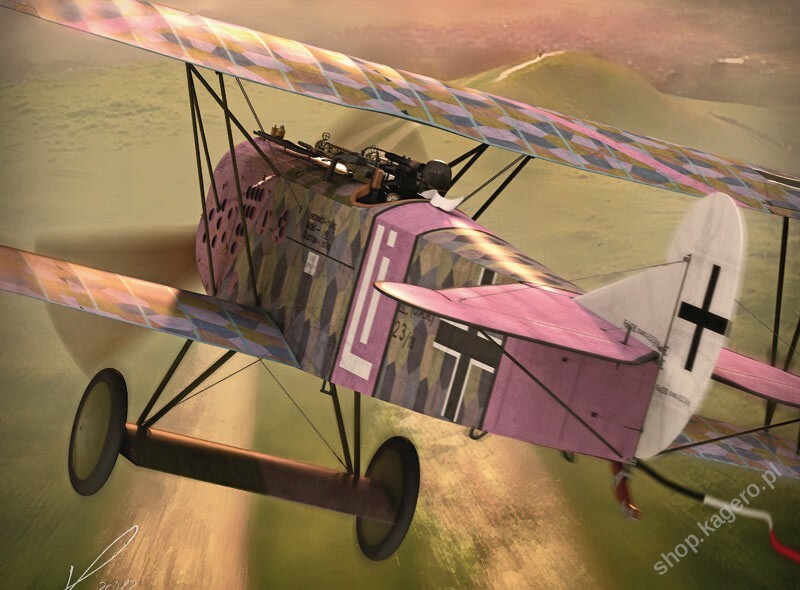 In mid April 1918 the first Fokker D.VII machines began arriving at squadrons (Jastas) 4 and 10, which were the part of Jagdgeschwader (JG) 1 under command of Rittm. Richthofen. At the end of April these squadrons had 19 Fokkers, first of which had a serial number 230/18. The second fighter wing, Jagdgeschwader II, was receiving the Fokkers in batches comprised of a few machines in June and July. Early weeks of the plane’s operation revealed two defects. First was fracturing of the wing canopy ribs at the second spar, but it was quickly remedied by introducing appropriate reinforcements. Mid-air fires were the second defect, which cost lives of many pilots. First such incident took place on July 15, 1918, when Lt. Friedrich Frienderichs of Jasta 10 was flying balloon busting mission in his D.VII 309/18. His plane burst in flames due to the spontaneous combustion of phosphorous ammunition and the pilot did not survive. Similar accidents happened to other pilots. The cause was soon discovered, when Lt. Bender of Jasta 4 survived such an accident owing to his parachute. It was the incendiary phosphorous ammunition stored in the ammunition boxes located in the engine compartment. Because of the overheating it self-ignited causing a fire. Therefore, it was necessary to improve not only engine cooling, but also that of its entire compartment. The solution was cutting additional cooling louvres in the engine cowling and ventilating holes under the radiator. The air flow from the latter was directed straight onto the ammunition boxes. Initially, these openings were made by individual Jasta workshops, but with time it was done by the manufacturers. Location of the cooling louvres varied on planes manufactured by individual factories. Another modification was the addition of removable aluminium covers in the front section of the fuselage and alteration of the exhaust manifolds. Twin manifolds, each collected exhausts from three cylinders, that were initially used, were replaced by a single one for all six cylinders. It was installed at the top of the engine. Introduction of the BMW IIIa engine designed by Bayerische Motorenwerke GmbH considerably increased the Fokker D.VII’s performance. The BMW engines had a 136 kW (185 hp) power output at the altitude of 2000 m. The power dropped with the altitude and at 6000 m it was 90 kW (120 hp). It was forbidden to use full throttle below 2000 m as it reduced the engine’s life-span. The first BMW IIIa engine was installed in Fokker D.VII 231/18. After the first flight on April 25, the factory pilot Neissen authoritatively stated: “the plane with this engine is very good, has an excellent rate of climb and the excess power allows for zooming at extremely high, almost vertical, angle. Then, the plane just hangs on its propeller”. These claims were highly exaggerated, but it must be borne in mind, that rates of climb of airplanes with contemporary engines left much to be desired. The Fokker D.VII equipped with the BMW engine climbed to 6000 m in less than 20 minutes. Maximum cruising speed was over 200km/h. Fokker decided to install the BMW engines in as many planes as possible. Production capacity of the BMW was the limit. By July, just under one hundred BMW IIIa engines were delivered to the Fokker and Albatros factories. Fokker D.VII planes equipped with the BMW engine received an additional “F” suffix in their designation. The Fokkers D.VII F were highly praised by their pilots. Oxygen apparatus was designed to allow flights at altitudes above 5000 metres. The use of the BMW IIIa engine required increased pilot’s attention. The use of full throttle at the altitudes below 2000m was forbidden, since there was a danger of destroying the engine. Production rate of the Fokker D.VII aircraft in all the involved factories was relatively high, but it did not fully cover the demands of frontline units for that type of plane. In August 1918 there were 828 Fokkers and slightly more than 300 Albatroses, not including older types like the Fokker Dr.I and Pfalzs in the squadrons. Fokker V.38 was a two-seater prototype powered by the BMW IIIa engine. It featured a lengthened fuselage with the observer position’s located behind the pilot’s cockpit. It had both greater wing span and larger wing area. The fuel tank was again located inside the undercarriage axle fairing, but a smaller gravity tank was also installed forward of the pilot’s cockpit. The plane was armed with one pilot’s forward-firing LMG 08/15 and observer’s machine gun on a flexible ring mounting. This machine served as the prototype of the Fokker C.I, which was mass-produced postwar. Prior to the Armistice Idflieg ordered 60 planes. Fokker transported the unfinished planes to Holland. Fokker C.I was a multi-purpose two-seater mass-produced in the Netherlands after the war. First planes were assembled from the components that had been brought from Germany. It was armed with one fixed machine gun operated by the pilot and another one on the flexible ring mount operated by the observer. In the 1920s approximately 250-300 planes were manufactured. They were powered by 118 kW (160 hp) BMW, 162 kW (220 hp) Mercedes or 118 kW (160 hp) Oberursel engines. The Fokker C.Is were exported to the Soviet Union and other countries. In 1932 Denmark obtained a licence for the construction of this plane. In 1940 the last Fokker C.I in Denmark was still in service. In 1929 the Fokker C.Is were being equipped with 147 kW (200 hp) Armstrong Siddeley Lynx radial engines. This variant was designated Fokker C.Ia. Fokker C.I-W was the single floatplane variant built in 1919. Fokker C.II was a three-seater, passenger plane development of the Fokker C.I, powered by the BMW IIIa engine, with an enclosed cabin for two passengers located behind the pilot’s cockpit. In the years 1919-1920 at least a dozen Fokker C.IIs were built. The later C.IIs were powered by 165 kW (230 hp) Armstrong Siddeley Puma engines. Fokker C.III was a two-seater trainer with two sets of flying controls, powered by 161 kW (220 hp) Hispano Suiza engine. Fokker D.VII (MAG) – Since March 1918, the Fokker D.VII planes were being built by Magyar Általános Gépgyár (MAG) in Budapest. As opposed to their German counterparts, they were powered by 154 kW (210 hp) Austro-Daimler engines driving Jaray four-bladed wooden propeller and armed with two 8 mm Schwarzlose machine guns. The Fokker D.VII (MAG) planes were modeled after the Fokker V.22 (Wn 2342), which was designated as 90.05. That plane, powered by the Austro Daimler engine no. 19245 driving a twin-bladed propeller and armed with Schwarzlose machine guns no. 34511 and 34537, was sent for trials in Aspern on April 24, 1918. On August 27, 1918, Austria-Hungary also received a single Fokker D.VII with a wooden fuselage for 30 000 marks. The Austro-Hungarian aircraft industry had a seriously limited potential, therefore the implementation of the Fokker D.VII (MAG) production was planned in five months. Launching of the production encountered difficulties caused by the lack of experience in working with welded steel structures. In October 1918 six complete fuselages (serial numbers 3861, 3863-3867) were delivered from Germany in which the Austro-Daimler 19.500 series engines were installed. The wooden wings were manufactured on site. The planes received series number 93 and were assigned consecutive numbers from 93.01 to 93.06. Their radiators were different from the German planes, since the MAG used radiators installed in the Berg D.I planes which were also manufactured by that company. The price for a single aircraft delivered from Germany was 23 500 marks. Decision was taken to import complete components without engines, radiators and fittings including control instruments. Prior to the Armistice a single, complete Fokker D.VII (MAG) was test-flown at the MAG. Apart from the MAG, 150 Fokker D.VIIs, series number 132, were to be manufactured by Osterreichische Ungarische Flugzeugfabrik Aviatik G.m.b.H, but it never went beyond the preparation phase. The end of October saw the collapse of the Austro-Hungarian Monarchy and therefore the end of the Fokker D.VII’s wartime service with the KuK air force. On November 11, 1918 Germany signed the Armistice, which stipulated the immediate demobilization of its air force and surrender of 2,000 combat aircraft to the victorious coalition. Actually only 700 operational aircraft were handed over, while further 1,000 given up to the victors were useless wrecks. Only the western front units were disarmed. The revolution that broke out in German and military operations in the east only limited aircraft production, but were unable to stop it. New customers interested in the purchase of military equipment emerged, including newly formed countries, such as Poland, Lithuania, Finland, Czechoslovakia, Latvia and Estonia. Only the signing of the Treaty of Versailles imposed more severe restrictions on Germany. Articles 198 and 201 stipulated that Germany must neither possess any military or naval air force, nor manufacture or import aircraft for the period of six months. The treaty was signed on January 10, 1920, but the Aeronautical Inter-Allied Commission of Control did not begin the supervision of its obligations until February 22, 1920. Therefore, the Germans had 15 months (from the signing of the Armistice) for unrestricted trade and production of aircraft equipment. Anthony Fokker put this time to good use, dispatching six trains to Holland, hauling approximately 350 wagons full of equipment and unfinished aircraft components.